We know distressingly little about the life of Johann Caspar Ferdinand Fischer: in summary, he was born in 1656 in Bohemia; his earliest known works date from his late twenties; he served in various courts, composing music for various patrons and for the church calendar. Twice married, he died aged 89 in 1746 with a much larger body of compositions than now survives. The style of what is left (the CD booklet sketches both Fischer's life and the likely breadth of what we've lost, and what is extant) is both richly contrapuntal in the contemporary German style and clearly influenced by Lully. Bach used a theme by Fischer (his E Major fugue) as a subject in the second set of the 'Well-Tempered Clavier'. Especially if new to Fischer, after about a minute of listening to the wonderful music on this CD, though, you will not need even Bach's implied endorsement to be sure of its merit and may instantly regret that so little else of Fischer's can still be found and heard. Indeed only two of ArkivMusic's excellent reclamations from Naxos – 8554218 and 554446 – really do his music any kind of justice aside from the present CD, which is actually the composer's entire remaining output for organ. So here are no fewer than 89 tracks of splendid and inventive organ music, unflinchingly and stylishly played by Serge Schoonbroodt, a German-speaking Belgian with several accolades already to his name: organ first prize at the Royal Conservatory of Music in Brussels and experience at Notre-Dame (in vocal technique) and Versailles. Having several recordings of music by contemporaries of Fischer to his credit, his ease and fluency in this idiom is as evident as his skill in presenting it with love and conviction. The CD may be one of those where even the most devoted reviewer adds, "Not something to be taken in at one sitting, but…" Begging to disagree, do listen carefully and without interruption. You'll be rewarded. After a few tracks you'll wish that Fischer had developed some of his ideas at greater length. You'll surely be struck by a complete lack of self-indulgence in his lively piety and by an amazing variety of dynamic, tonality and tempi as theme after theme seems to presage the semi-symphonic organ writing of a Liszt or a Franck two centuries later. In other words this persuasive offering will leave you wanting more, and lamenting that one of Fischer's patrons, the Margrave Ludwig Georg, forbade that the musical 'holdings' in Rastatt 'be copied here or there and be made known in all places'. 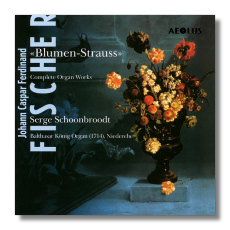 In addition to a handful of ricercars and 20 Preludes and Fugues comprising 'Ariadne Musica', the 'Blumen-Strauss' consists of eight Suites (also of preludes and fugues), which take up over half the CD and – each in a different Mode – comprise the most substantial item. So, despite the aim of including all Fischer's extant organ works in one go, these are discrete cycles as such. Indeed the 'Ariadne Musica' can be seen as a forerunner of Bach's 'Well-Tempered Clavier' exploring pairs of keys, some of which were otherwise too remote or (because tuned in meantone) thought too 'impure' until well into the eighteenth century. It's through this labyrinth that Ariadne leads the organist; although the way in which the cycle ends on the same key as it begins means it's a perpetual maze. Each pair is linked thematically and counterpoint takes second place to melody; and very beautiful melodies they are. Similarly the 'Blumen-Strauss' or 'Floral Bouquet' (we'd say 'Florilegium') is an anthology actually intended for the liturgy and in a much more conservative idiom than the 'Ariadne' of 30 years earlier with cross-references and dance movements. Schoonbroodt plays on the Balthasar König organ (1714) of the former monastery church St. Leodegar, Niederehe, which was entirely pumped by hand during the whole recording of this generous (78:46) CD. A gem, then, full of upbeat, happy, positive music excellently played, with comprehensive (if a little hard to read in places: black on a gray background detail) booklet. Unreservedly recommended.